Lincoln, Neb. — Chuck Hagel and Bob Kerrey openly admit that they didn’t always agree while serving as U.S. senators for Nebraska. Yet the two were able to set their differences aside to serve the interests of the people. 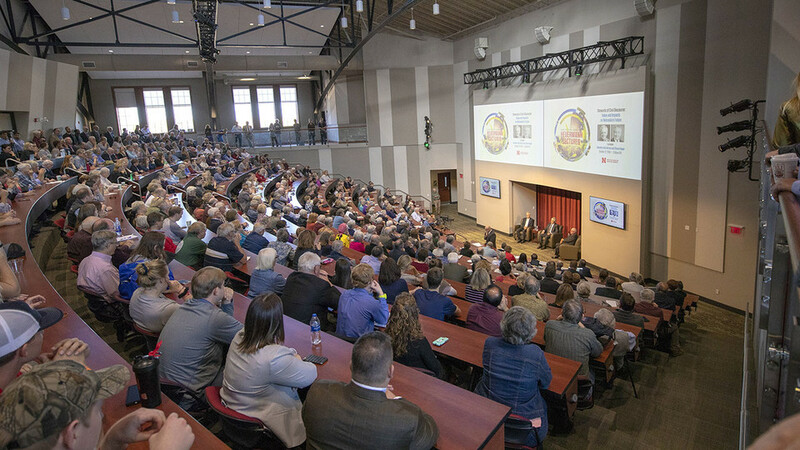 That kind of compromise is lacking in Washington today, they told an overflow crowd during the first Heuermann Lecture of the season Oct. 22 at Nebraska Innovation Campus. The free lecture was sponsored by the University of Nebraska–Lincoln’s Institute of Agriculture and Natural Resources. “Bob is a Democrat. I’m a Republican. But we didn’t lose sight of why we were there,” Hagel said of their time in the Senate. He said compromise for the greater good was common while the World War II generation was serving on Capitol Hill, but that bipartisan mentality doesn’t exist today. 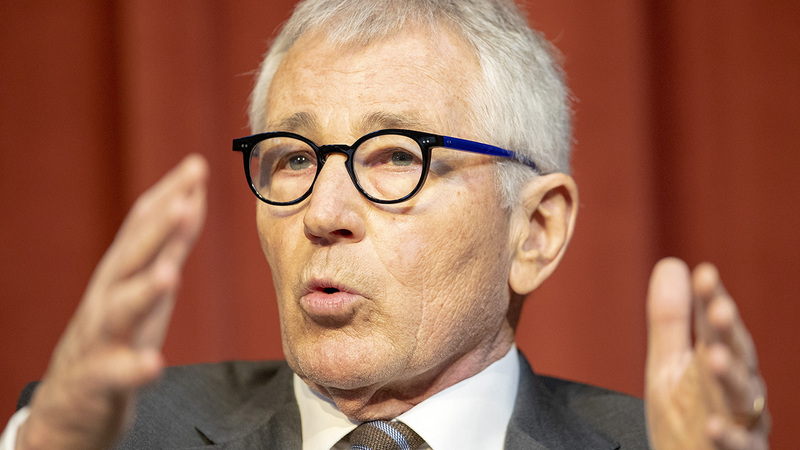 "We are not seeing the leadership required in our country," said Hagel, who added that he doesn’t care whether someone is Republican or Democrat, and instead looks for leaders with character, courage and good judgment. He’s hitting the campaign trail in North Dakota this week in support of Democratic Sen. Heidi Heitkamp. The former senators said the issues go much deeper than whether someone supports the president. It’s also about what people are doing to improve their homes and communities. “If you see something that is substandard and don’t do anything about it, that’s the new standard,” Kerrey said. Despite the challenges facing the country, Hagel and Kerrey said they remain hopeful for the future. They long for a return of civil leadership and are confident American politics will find its new center of gravity. “It’s a whole lot easier to get up in the morning if you’re hopeful,” Hagel said. The two said educational institutions will play a critical role in helping the country unify again. Such institutions are key in helping young people to think for themselves and learn to listen to others with different viewpoints. According to Kerrey, leadership starts with the ability to truly listen to others. 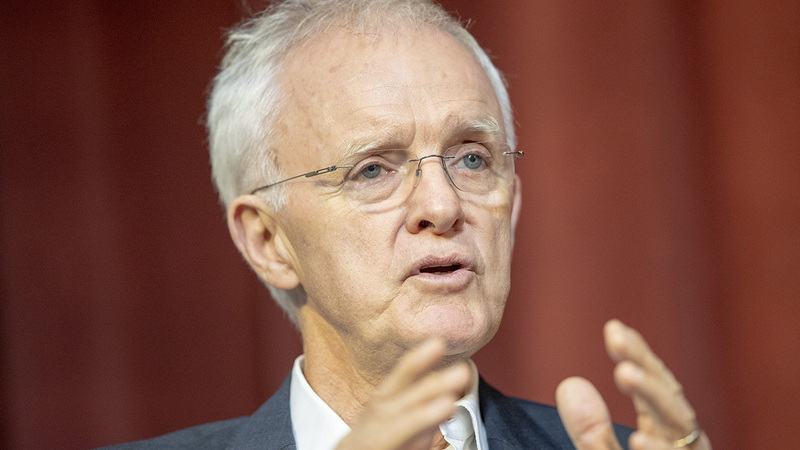 Kerrey praised the basic research occurring within IANR, which he said is just one example of the immense influence the University of Nebraska has on society. “Every single program at the university contributes either to the economy or to a better understanding of who we are,” he said. Hagel was the 24th secretary of defense, serving from February 2013 to February 2015. He is the only Vietnam veteran and the first enlisted combat veteran to be secretary of defense. He also served two terms in the U.S. Senate from 1997-2009. He was a senior member of the Senate Foreign Relations; Banking, Housing and Urban Affairs; and Intelligence committees. Prior to being elected senator, Hagel was president of McCarthy and Company, an investment banking firm based in Omaha, and chairman of the board of American Information Systems. Kerrey is managing director at investment banking firm Allen and Company, based in New York. He is also the executive chairman of the Minerva Institute. Kerrey served two terms in the U.S. Senate from 1989-2001. He was on the Senate's Agriculture and Forestry Committee and was a leader in drafting farm legislation, soil and water conservation statutes, and regulations to promote equity in rural health, communication and transportation. Prior to serving in the Senate, Kerrey was Nebraska's governor for four years. He also served three years in the U.S. Navy in the Vietnam War and received a Congressional Medal of Honor for his service as a Navy SEAL. Heuermann Lectures are funded by a gift from B. Keith and Norma Heuermann of Phillips, Nebraska. The Heuermanns are longtime university supporters with a strong commitment to Nebraska's production agriculture, natural resources, rural areas and people. Lectures are streamed live here and air live on campus channel 4. They are archived after the event and later air on NET2 World.